Norm walked as a young walker in the 30’s but his career was stopped by the Second World War when he enlisted and served overseas as a LtCol. Upon his return to civilian life, he involved himself once again with VAWC and was part of the Financial Committee which had the tough job of getting the club back onto its feet. The Norm Goble trophy was instituted at this time and remained a popular trophy for many years. 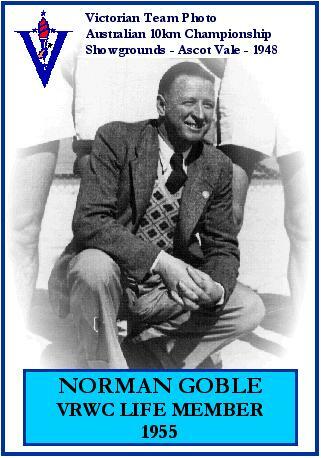 He became club Vice Captain in 1947 and then served as club Captain from 1948-51. He won the Victorian 50 Mile club championship in 1948 in the fine time of 9:21:24 and was a regular team manager with our teams for the National Championships. In 1952, he became secretary and treasurer of VAWC. He was awarded life membership in 1955 but this did not lessen in any way his commitment to the club and his ongoing enthusiasm. He served as secretary till 1971 (20 years) and as treasurer till 1973 (22 years). He and Alf Robinson (who served during this whole time as President) were the driving forces behind the club and were responsible for the continuing development of the club over this whole timeframe. Forced out of the club administation by the tragic onset of Parkinsons Disease, Norm continued to judge and act as an official wherever possible until he died in 1979. Both Norm and Alf (who died in 1977) were now dead. They had guided the club for so long that all members recognised that this was the end of an era. It was left to a new group of enthusiastic members to pick up the baton and to move the club forward into a new era of athletics in Australia. A number of trophies are awarded in memory of Norm. 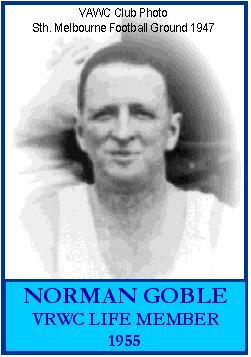 The Norman L. Goble Trophy is awarded annually by Athletics Victoria to the male competitor who earns the most points in A. V. championships. The Goble Trophy is awarded annually to the winner of the AFRWC Boys Under 15 3 km Championship held in conjunction with the Schedule 1 Carnival.